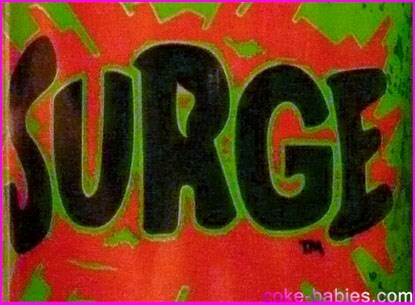 I’m going to get the shameful admission out of the way from the start – I never went super crazy for Surge. 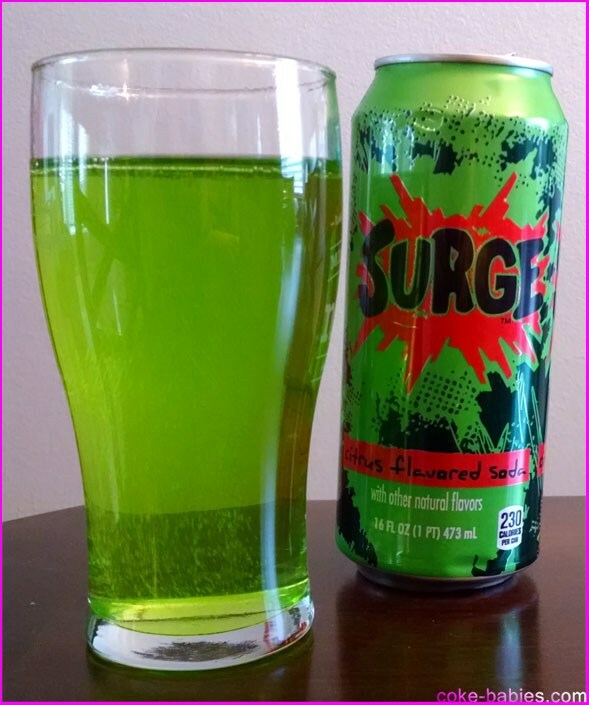 It was very enjoyable, but when thinking about it objectively, I think a lot of my love for Surge is due to the nostalgia-tinted glasses used to look back on the mid-90’s. Oddly enough, I liked Vault a lot, which for all intents and purposes, was Surge on steroids – very similar taste but a bit more carbonated and a much higher caffeine content. Then a few years back, Vault was discontinued, and I wasn’t too bothered. It’s like when a distant relative dies – it’s sad, I guess – but my life won’t be that affected. One reason I miss Vault a little less is that King Soopers sells a citrus soda that, while not identical, is close enough to satisfy my cravings for that flavor. 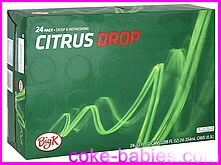 It’s called Big K Citrus Drop Xtreme, which you know is an intense soda since not only do they describe it as extreme, but they had to start the word with an “X”. Big K, however, didn’t have the (cough) subtlety of MDX’s name. I’d known about the “Save Surge”-esque movements online for the past few years. The most famous of which is the Surge Movement Facebook page. The current atmosphere there is what I’d imagine NASA’s control room looked like after they successfully had a man land on the moon. Despite not being particularly heartbroken about Surge’s untimely death, I appreciated the efforts. There are lots of random foods and drinks from the past that I’d like back. So to see people putting in actual effort to bring back one of their beloved sodas, well that was pretty cool. There are a couple changes between 90’s Surge and uh, 10’s Surge (10’s sure is not a catchy term). The can is now 16 oz. instead of 12 oz., presumably to attract energy drink fans to Surge. Not that attracting attention to this will be a problem, but more on that in a bit. The other change is a couple of minor ingredient changes – a HFCS / sucrose mix for the sweetener is now all HFCS, and two chemicals meant “to protect taste” have swapped. But the artificial colors are the same, so the soda’s hue should be exact. Speaking of colors, one of the best parts of this re-release is the can’s design. They went with a design almost identical to the initial can design. 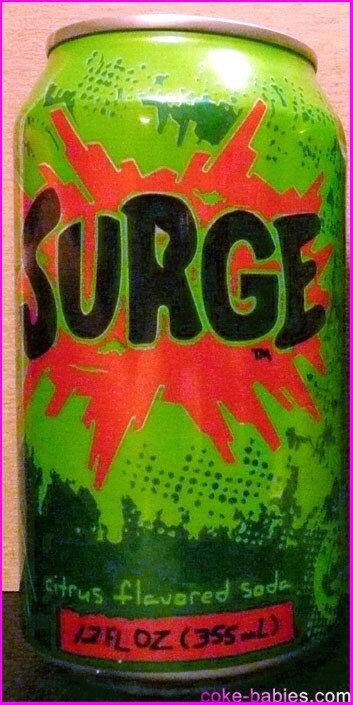 When Surge was first introduced, it was in a very 90’s-inspired can design – “radical” coloring, Gen-X-tastic exploding logos, and fonts ripped right from an Image comic book. Somewhere along Surge’s lifetime, the can was re-designed. The re-design wasn’t bad, but it definitely muted the comic book-esque appearance, and gave it a much more sterile color palette and logo font. 2014 Surge’s can is very similar to the initial can, – it even keeps the “hand written” look for much of the front text, which is a nice touch. The new design looks like if you used the original can’s design as a first draft, and just smoothed out some rough edges. Besides the size increase, the biggest giveaway that you’re drinking a can from modern times is the giant “230 calories per can” notice at the bottom. Aesthetics-wise, the only disappointment with the twelve pack is that it comes plastic wrapped in a plain cardboard box. No noxious green cardboard box, unfortunately. Although if they did go that route, I wonder if they’d go with the longer fridge pack design, since I think Surge only came out in the 4×3 soda boxes. And yes, these are thoughts I think of and find the possibilities of interesting. The other downside is that my shipment was slightly manhandled. Some of the cans had jacked up tops, and the ones that didn’t had severely banged up bottoms. But I had a couple cans pretty enough to take a picture of. And besides, it’s what’s on the inside that counts. At least, I’ve heard people say that. As further evidence that the recipe hasn’t changed much, the caffeine content is still the same. 57 mg for a 12 oz, 69 mg for a 16 oz. can. So Surge went energy drink size, but not energy drink caffeine content. This is not a bad thing, as I will mention in a bit. Pouring a can, I was greeted with that wonderful shade of green. 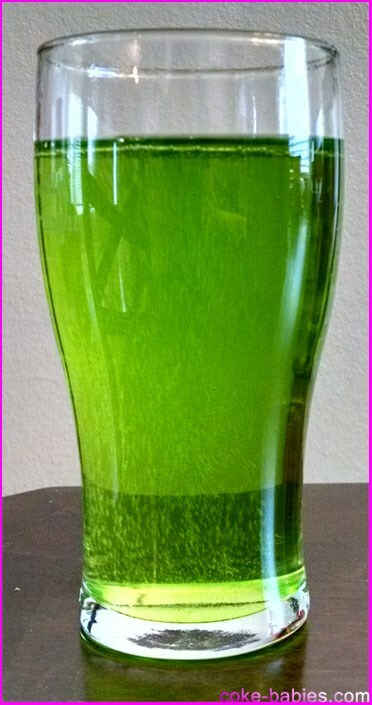 No neon Mountain Dew green, just a green that can only be describe as GREEN. So if describing the color to someone, you would be required to shout that word. Regarding the review of the revived Surge’s flavor – again, despite my perverse levels of soda love, I’m not on that next-level Surge status. So when talking about old vs. new flavor, I’m going off old memories, and some possible memory tampering from Vault’s flavor. Now, onto the important part : taste. It’s… really good. Much better than I remember, actually. I think my time with the Vaults and Citrus Drops Xtremes has tainted my Surge memory. Since those sodas have especially (Xpecially?) high levels of caffeine, they also come with that medicinal, battery acid-esque bite. 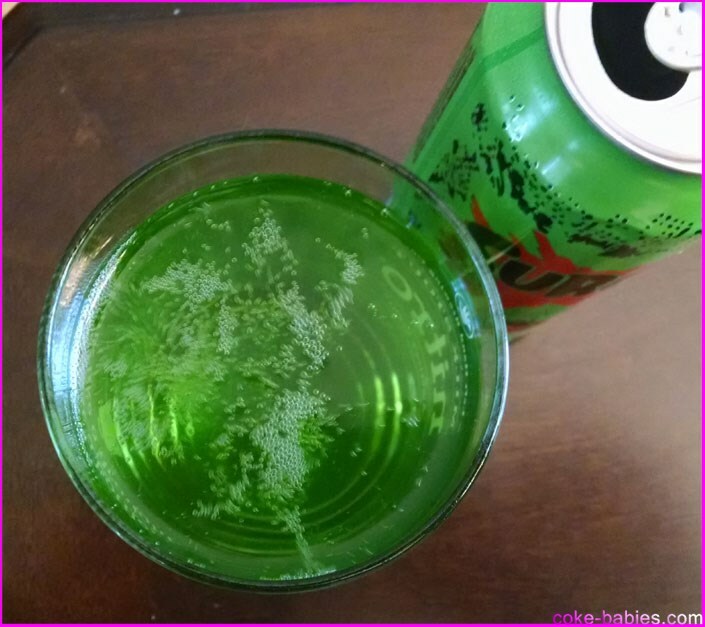 Since Surge has a very reasonable amount of caffeine (only 3 mg more per 12 oz. than Mountain Dew), you get none of that. Surge has a bit… I don’t know, deeper flavor than Mountain Dew? It’s hard to describe the flavor. Though if you’re reading this, I’d have to assume you already know what it tastes like. But if you’ve never tried it, it’s a citrus flavored soda. If you don’t believe me, you can check the front of the can. Surge has a bit more of the lime aspect of “citrus” than Mountain Dew. I’m also so accustomed to drinking diet soda that I forget how good a sugary soda with that nice balance between carbonation and syrupy thickness can be. As you can (sort of) see, the carbonation is at a very nice level, while still keeping the sugary consistency. People complain on the internet every day. It’s basically become one of our country’s greatest industries. Most of it is just insane jackasses commenting on Youtube videos or Yahoo! articles. But once in a while, you get a group of people dedicated to a just cause, who work until the job is done. Say what you will, but the Surge Movement got it done. They brought a dead product back to life. I don’t know if the numbers will justify Coca Cola bringing this back into stores, but I definitely don’t see why it wouldn’t live on like this. Sure, once the hype dies down, sales might slip a bit. But given that this went on sale two days ago, and has been sold out for approximately 99% of that time, that says something. 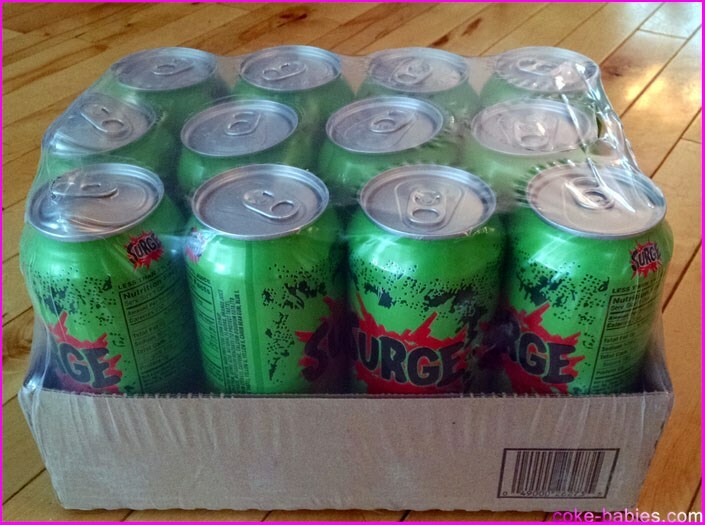 Plus, you will have the Surge fanatics who will buy a pallet of it at a time, if that’s what it takes. 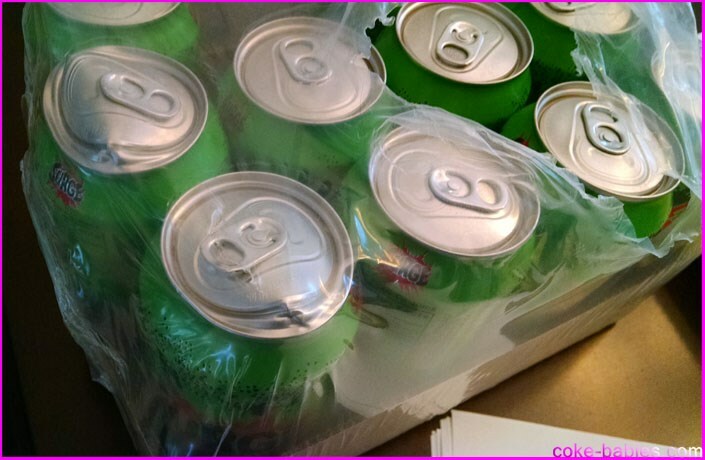 So Coca Cola – let’s get some confirmation that this is going to reach regular distribution levels. That way, the Surge Movement can take a break from bringing Surge back, and they can shift their attention onto a matter slightly more important to me: The Coconut Yoo-hoo Movement.